A claim of racial superiority denies our common humanity, our common sinfulness, our common salvation through faith in Christ, and God’s purpose to create a common new humanity in Christ. Below is a Tweet I published a few months ago. Albert Mohler is standing proudly with a portrait of Confederate Captain John Broadus. I included a quote from Captain Broadus. The chapel at Southern Seminary is named after Captain John Broadus! Below are a couple of Tweets I captured from Albert Mohler and Rick Holland, but first read the quote from James P. Boyce. One may legitimately question why these men are paying tribute to men who held such views of slavery and blacks. Yet Al Mohler does not appear to have any sense of disconnect with the words he wrote at the top of this article and his actions which appear to be in direct contradiction to what he wrote. 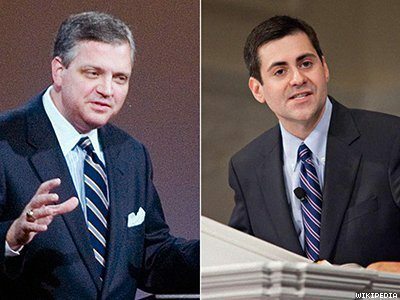 I am still waiting for Mohler to renounce his support of C.J. 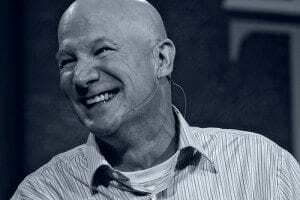 Mahaney and specifically call for an independent investigation of the sexual abuse scandal and cover-up which occurred in Mahaney’s SGM denomination. 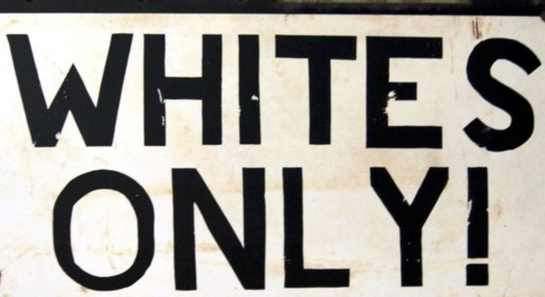 Now we have further evidence of Albert Mohler’s hollow words on racial equality. On May 10, 2018, an interesting video appeared on YouTube. In the video, Paige Patterson revealed that Albert Mohler was a member of a secret organization on the campus of Southern Seminary called “Dodeka.” This secret society was an elitist club for whites only. Those who were extended an invitation to join Dodeka were judged to be the best and brightest young men among those pursuing their Master’s degree at Southern Seminary. Below is the first video of two that I recorded from a YouTube video titled “Tea Talk With Dottie P. – Episode 1.” I made copies of the video because it has been my experience that videos like this frequently disappear from YouTube. If you wish to view the video on YouTube here is the link. Paige Patterson does most of the talking – nothing unusual there! In the second video (below) Patterson is asked whether W.A. Criswell or Herschel Hobbs were members of Dodeka. He responded that neither men were. Patterson is in error about Herschel Hobbs and while I cannot confirm whether W.A. Criswell was a member of Dodeka, based on his strong friendship with Herschel Hobbs it would not surprise me if W.A. Criswell was also a member. “During his years at the seminary, Hobbs developed strong friendships and created a wide-ranging network that would serve him well throughout his life. Many of these relationships grew out of his involvement in a “secret supper club” called Dodeka, the Greek word for twelve. Each year, twelve couples were invited to join this exclusive group. Herschel and Frances were received as members during their first year at the seminary (see Faith and Message, 63). Important friendships with W. A. Criswell and others were birthed during this time. Hobbs was the first guest preacher Criswell invited after he was called to the pastorate of the First Baptist Church, Dallas, TX. Hobbs also drove the “getaway car” at the wedding of W. A. and Betty Criswell. The video below is also a copy I made from a YouTube video. The full video may be seen here. The scene is a “Q and A” session between Southern Seminary students and Al Mohler. This occurred in 1993, shortly after Al Mohler, at the age of 33, was elected the 9th President of Southern Seminary. The student was brave enough to question Mohler about his membership in Dodeka. Mohler termed Dodeka a “social group,” a “dinner society” that he and his wife took part in, and said, “frankly I would not be a part of a secret society.” He reassured the student that “there is nothing sinister there,” and as a Christian, he is opposed to any type of secrecy. Mohler then artfully painted Dodeka as just one of many campus clubs where fellowship takes place and said this was a very positive aspect. Mohler obviously lied when he stated he would never be a part of a secret society. It has been established above that this is precisely what Dodeka was. Left unsaid was whether the Dodeka society was still in operation. I was also struck by the fact Mohler made no mention of the role Dodeka played in his amazingly rapid rise in the Southern Baptist bureaucracy. But then, that would undermine his narrative of Dodeka being a nice little social group. What did take place at those Dodeka meetings? It’s hard to say without the testimony of an actual member. One interesting thing my blog partner, Janna found was the cryptic add below placed in the Louisville newspaper in 1959. I really do not know what to make of the add. David Hoy was at one time a student at Bob Jones University and Southern Seminary. After his schooling there he completely shed any vestiges of Christianity and became involved in the occult. Below is some information about Hoy. “Dr. David Hoy, one of America’s foremost authorities on extrasensory perception, is a scholar of extraordinary psychic capacity. He has conducted a lifetime study of mind-to-mind communication and is world-renowned for his ESP experiences and research conducted under scientific conditions. He is also the author of several books on ESP, read by a large following in seven languages. Dr. Hoy’s astonishing predictions have been well documented and proven to be 85% accurate. David Hoy predicted Bobby Goldsboro’s smash hit recording of “Honey” weeks before either of them ever heard of the song! Sixty days before the Silver Bridge collapsed into the Ohio River near Point Pleasant, W. Va., in 1967, David Hoy predicted the disaster on a taped program at radio station KDKA in Pittsburgh. Two years before Jackie Kennedy and Aristotle Onassis were wed, David Hoy predicted the match on Boston radio and TV! Two weeks before the assassination of Sen. Robert Kennedy, David Hoy predicted at Tusculum College in Greenville, Tenn., that Kennedy would win the California primary but that it would be fraught with tragedy! In January of 1969, David Hoy predicted that because of personal tragedy, Sen. Ted Kennedy would not run for the presidency in 1972! Was Dodeka involved in the occult? I cannot say, but I will say that many secret societies are, and I find it very troubling that David Hoy was mentioned in the add for their meeting. What is not in doubt, however, is that Dodeka was a racist secret society involving many of the top men in the Southern Baptist denomination. I call on Albert Mohler to come clean on what Dodeka’s actual purpose and goals were and what his involvement in the society entailed. Until such time as he does, his words on racial equality are hollow. Five of my cousins who graduated in the mid to late 80s had never heard of Dodeka. The other two, who graduated early 80’s, are in Vietnam for several months and I was told their WiFi is spotty. Guess this means they weren’t well connected! Lol. I tried to do some cursory research on the Board that brought in Mohler to see if any names jumped out at me. I came across an old BP press release of nominations and elections and saw the name of a good friend and business colleague of my mom’s was NOT elected to SBTS Executive CounciI in 1990. had no idea he was involved at all! But he has since passed on. That is one of the age advantages Mohler has from being appointed at 33. His kingmakers have mostly passed away by now. I’m told that some Yale students are declining to join Skull and Bones, because it’s creepy and they don’t like its reputed values. Perhaps your cousins weren’t inducted into a secret society at SBTS, because they were grounded people with integrity. How bored do you have to be to put secret messages in newspapers? I don’t know if Dodeka was or is evil. I do think it seems goofy. Janna, I think for a lot of men in the early part of the century, the Masons was more of a business decision. . I don’t view it the same way many do now. Here, they were very connected to Shriners who built children’s hospitals early 20th century and kept them functioning quite well. 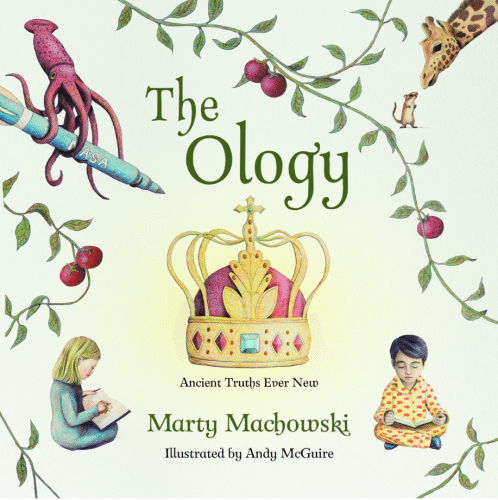 McArthur teaches that Masons were not saved. Whatever. The weirdness about Dodeka is how secret it’s existence was/is all these years witin a Christian organization. Mohler said he’s about transparency. He needs to introduce us to the other members! Lol. Thanks, Lydia. I don’t have a problem with people being free-masons. I do have an issue with Mohler’s hypocrisy regarding organizations that use pagan imagery, which many evangelicals find offensive. Al Mohler spends a lot of time condemning yoga because its imagery and philosophy are associated with paganism via Hinduism, the oldest known organized religion in the world. Then he gives scholarships to free-masons, who are heavily into occult imagery, for no apparent religious reason. So it’s a sin to do yoga exercises to fix a back problem, but free-masons who wear wizard robes and draw pentagrams on the floor get scholarships to the Southern Baptist Theological Seminary? This is hypocrisy in its most fatuous form. And yes, Dodeka was publicly endorsed by the President of SBTS in 1935, as the article clip I referenced in a comment proves. However, it is now seems to be a secretive organization that may participate in occult rituals. Mohler has some explaining to do. Thanks again for historical information. I have traveled all over the world, as a diplomat’s daughter. However, I haven’t spent much time in the American South, apart from being born in Virginia. To be honest, I don’t recall spending much time in any deep southern state besides Georgia, where a good friend lives. If Paige Patterson dislikes Dodeka because he thinks it’s a secretive, white-supremacist group, then why didn’t he speak out about Mohler’s involvement with Dodeka earlier? It looks like Patterson is just lashing out at at Mohler, because Mohler is now trying to blame all the SBC’s problems on Paige Patterson. Few major SBC leaders act with much integrity, in my opinion. All they care about is their shared business interests. To me, the big problem with secret societies is that they often have a cult-like aspect, which negatively affects the moral judgment of their members. Loyalty to the group can easily become more important than following the law or adhering to one’s true religious beliefs. Society as a whole cannot, by definition, hold people accountable for secretive behavior as long as it remains a secret. Is C.J. Mahaney also a free-mason? Is Mohler unable to betray a Masonic brother? I’d like Mohler to publicly state that he is not protecting C.J. Mahaney because they are both free-masons. Go to about the 13:30 mark to listen in on how many Baptist ministers are Free Masons. Around the 14:00 mark he talks about how much sexual abuse is carried out by Masons. Thanks, Todd, for pointing out that people have traditionally perceived, fairly or not, a sinister side to the Masonic movement/organization. I don’t think that should be disregarded even though free-masons are less secretive than they used to be, and they unquestionably do good social work, as Lydia pointed out. My concern is not whether Masonic lodges are inherently good or evil. It’s that Mohler and many other evangelical leaders have condemned other movements or organizations that utilize what they perceive to be pagan or occult imagery. Mohler, in particular, is very dismissive of and aggressive toward “new age” practices including Wicca. I can’t help but notice that Wicca is often practiced by women. In other words, Mohler, in my opinion, is promoting a traditional double standard regarding gender roles and occult rituals. Women can’t be Wicca without being accused of heresy, yet male free-masons can engage in the same behavior with impunity. Again, this is hypocrisy, on his part. Thanks to someone at The Wartburg Watch, who has found evidence that the Southern Baptist Theological Seminary gives scholarships to people associated with a Masonic organization. As said before, that newspaper clip was quite the investigative find. My wife and I were talking about the similarities between the political world and the church world. In politics we see elitist who play by a different set of rules than the general public. They apply rules to us that they themselves do not live by. The same for the celebrity elitist in the Christian world. Rules applied to the sheep that they do not live by. Now looks like we can add secret societies to list of comparisons. I would not be surprised if many in their ranks are freemasons as well. Thanks, Charlie, for your great comment. I agree with you 100%. In general powerful men, in the United States, appear to be have been drawn to secret societies for a long time. Why would’t Southern Baptist leaders also grasp at power and prestige in this way? Yes, that Dodeka message placed in the ad section of the Louisville Journal Courier was a great find. I’m sure that whoever placed it in 1959 couldn’t imagine that 59 years later, someone could locate it in 20 minutes on a computer. The wording of that Dodeka ad is bizarre, and it also appears to reference a well-known Baptist minister who later became a famous psychic, in the secular world. There’s also proof that this man attended SBTS. According to my calculations, the David Hoy whom I believe the ad references, would have been about 28 in 1959. Therefore, he was the right age to have been a current or recently inducted member of Dodeka at SBTS. 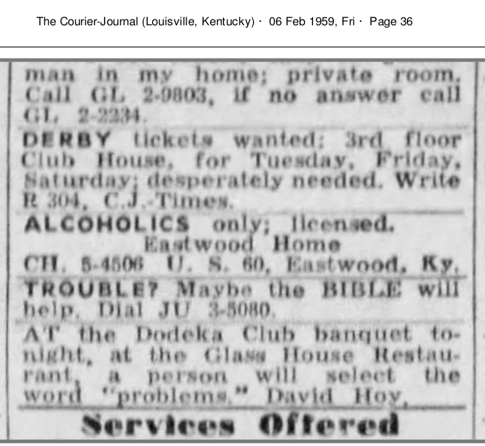 Is it a stretch to say, for sure, that Dodeka was into what would have been considered occult practices in 1959, based on one advertisement in the Louisville Journal Courier? Yes, it is. However, I’d love to see Al Mohler or any other member of Dodeka explain what that ad is referring to if it is not a secretive code of some kind. Box 12: Alzheimers, Correspondence – Zoo, Louisville, 1965-2010Add to your cart. —Folder 35: Dodeka, Club, 1951-1985Add to your cart. This collection is located in an off-site storage facility. Any researcher wishing to use the collection should contact the archives at least a week in advance in order to ensure that the portions of the collection they wish to access can be transferred to the library. Because the collection is located off-site, access will only be provided when there is a legitimate research need. Somehow I doubt that SBTS would consider my interest in Dodeka a “legitimate research need.” 😉 I’m a little surprised that such a well-known seminary feels the need to control who sees the material in its basic archives, to that degree. The truth is that I’m sure that the Southern Baptist Theological Seminary has sanitized any files referencing Dodeka, in its possession. Wake Forest University also has material in its archives about Dodeka, and it was once affiliated with Baptist groups but is now a secular university. The problem is that acquiring material from Wake Forest isn’t cheap, and I don’t belong to any elite organizations that are willing to foot the bill for any of my projects or ambitions. Dodeka was not always secretive. I found another article in the Louisville Journal Courier stating that the President of SBTS spoke at Dodeka’s 1935 annual dinner. Todd found a couple old obituaries in which membership in Dodeka was openly listed as an accomplishment. The group doesn’t seem to have gone completely underground until the 1960s. My research indicates that rumors that Dodeka was defunct started circulating around the early 1990s. Al Mohler became the President of SBTS in 1993. Regarding Paige Patterson’s claim that Dodeka was racist, why doesn’t Al Mohler refute it? In the video Todd references, Mohler says that there was nothing secretive about Dodeka. In that case, why can’t Pastor Mohler produce some non-white members of the organization? Apart from Dodeka, I think that tearfully refuting racial injustice is incompatible with proudly doing a photo op in front of the statute of a pro-slavery, white supremacist, Confederate officer. We live in a time in which the influence of Neo-Nazi groups is closely associated with Confederate imagery. Pastor Mohler should re-name Boyce college and get rid of all statues or monuments deifying the Confederacy. Otherwise, he’s just paying lip service to the idea that he detests racial injustice. Janna, Both Lincoln and Jefferson Davis were Ky born. Our Capitol Rotunda has statutes of both. Louisville had free blacks but Lexington was a slave market. We have always been weird. Lincoln is quoted as saying, “I HOPE TO HAVE GOD ON MY SIDE, BUT I MUST HAVE KENTUCKY’ – ABRAHAM LINCOLN”. His best friend, Joshua Speed, was here. Most of Ky was Union. My father’s ancestors had an Underground Railroad in Maysville on the Ohio. I am not a fan of erasing history/art in statue form for many reasons but get your point about hypocrisy. The fact is Mohler was the guy declaring that the SBC must go back to its “founding roots” for the true Gospel. Thousands of young people followed him off that cliff without doing any homework. But now he is ignoring what he taught just a few years ago for his brand of social justice. I think too many of us were on the blogosphere pointing out the “SBC’s founding” hypocrisy and the movement stopped growing after 10 years or so. They needed a new Shitck. The fact is the SBC majority evolved away from the determinist god doctrine after the war. Mohler was selling that as “losing the true Gospel”. But Mohler Was built up so much and he is so adept and slick the young don’t question anything from him— or Russ Moore, his former protege. I do view all that has taken place and is happening now as a huge social/psychological groupthink experiment— right before our eyes. These guys are superior mass manipulators. They know how to use people to their own ends. And they have positioned themselves as the good guys who got rid of the bad guy. But they are all bad guys! Oh well. It worked. Thanks, Lydia. I thought that Jefferson Davis was born in Fredericksburg, Virginia. My ignorance doesn’t matter much on that subject, I guess. I understand that removing confederate imagery is controversial. I should have qualified my earlier comments about that subject by saying that in my opinion, Al Mohler should follow the trend at many universities and remove symbols, artistic or otherwise, that the current, growing, and violent Neo-Nazi movement in the U.S. is rallying around. Certainly, proudly posing in front of a picture of a white supremacist, pro-slavery, confederate officer clashes with Mohler’s stated beliefs that Christians were wrong to believe in the legitimacy of slavery, in my view. As for your other comments, Mohler is a fraud, in my view. The guy claimed to be a conservative Baptist and then created what I consider to be a bizarre Baptist/Calvinist seminary. Mohler doesn’t care about theology; he cares about his personal power. I now think that Mohler was likely just a front man for Dodeka and other arch-conservative factions of the SBTS. He was a 33-year-old nobody who sold his soul in exchange for becoming a “somebody.” I guess. Mohler thinks he’s the protestant pope. I think he has delusions of grandeur. I was thinking along the lines of a museum of sorts. What we (royal we) got wrong and why. Here is a statue of a guy that got God wrong, sort of thing. Germany did this with concentration camps. Never forget. Let’s learn from it not erase it or put it out of sight. That’s how things get repeated in other variations. Can you imagine the spark that would light discussing God/history, etc. But Mohler can’t do anything that because he promoted the pro slaver SBC founders as having the true Gospel. He wants us to forget that.. I think Mohler needs to go. He should have been gone long ago, actually, for a lot of evil things he has done. I agree, Lydia. We should have discussions about removing offensive imagery, as opposed to just getting rid of it for expediency’s sake, because it’s not politically correct. Therefore, the SBTS should at least consider having a serious debate about the appropriateness of proudly displaying confederate stuff on campus, in my view. Paige Patterson also appears to be alleging that Dodeka is a white-supremacist organization. If so, that’s another possible reason that Al Mohler wants to publicize photo ops of himself standing in front of an unapologetic-ally pro-slavery (this guy wasn’t making a broad “state’s rights” argument) confederate officer. All Mohler has to do to refute Patterson’s allegation that he’s racist, is produce some non-white Dodeka members. Since Mohler claims that the organization was just a harmless supper club, its members should be willing to identify themselves, in my view. >its members should be willing to identify themselves, in my view. That’s an excellent point Janna. Let Al Mohler give us the names of all who he ate dinner with at the Dodeka diners club! Given the incredible emphasis on supper, at a seminary, I can’t help wondering what these Dodeka members were eating. 😉 Can we see a menu, too? Btw, Janna, that ad in an old paper here for Dodeka was quite the find!!!! Kudos to your work! Lydia, thanks for filling us all in about the details of Al Mohler’s incredibly rapid rise from obscurity to being the de facto leader of the SBTS. You know more about that subject than I do. It now seems that Pastor Mohler isn’t just a brilliant, Godly man pre-destined for greatness, as his devotees would have us believe. Rather, he had a powerful, secret society backing up his grab for power in 1993, during the Southern Baptist conservative resurgence. Dodeka seems relatively equivalent to Yale University’s notorious Skull and Bones society. Laughing off such institutions is tempting, because they seem goofy when they put odd, cryptic advertisements in newspapers. 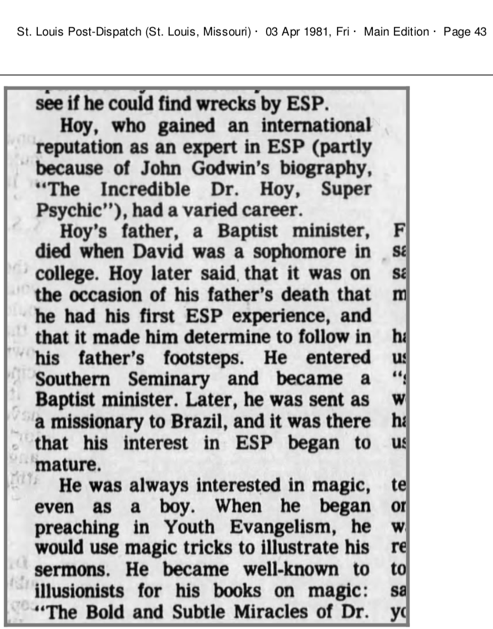 I wish I could ask the world-famous psychic David Hoy more about his reputed ties to Dodeka. In particular, I think that the ad in front of the Dodeka ad, is part of some type of numerology puzzle. Like the Dodeka ad, it makes no logical sense. Unfortunately, David Hoy died at age 50, on April 2, 1981, so I can’t follow up with him. Al Mohler, in my opinion, condemns any type of Eastern religious practice as being sinister or occult-like. Thus, it would be hypocritical of him to belong to a secret organization that engages in psychic activity, as David Hoy did. People noted that in 2004, Skull and Bones likely only had 600 living members. Two of them, John Kerry and George W. Bush, ran against each other for the U.S. Presidency that year. Dodeka is not as influential as Skull and Bones. However, I’m sure that its members include powerful business-men and politicians, not just clergy-men. These fellow members of Dodeka could have helped Al Mohler practically take over the SBC at age 33. Regarding its possible quote unquote occult aspects, Dodeka appears to have been founded around 1920, when seances and other metaphysical activities were very popular. Arguably, most secret societies in the U.S. have traditionally contained an occult element due to the ties the founders had to freemasonry and similar organizations. People who say that the United States was founded as a Christian nation appear to be overlooking the fact that the U.S. $1 bill features both a pyramid and a masonic eye. Thank for the compliment regarding my research skills. Alas, I must confess that I did not search through reams of microfiche to find references to Dodeka. There are actually a few more less interesting ones out there. I found them through the an incredible resource called newspapers.com. Hundreds of thousands of articles, dating back to the 1700s, have been scanned into its database. The service isn’t free, yet I’m finding it an invaluable research tool. I have seven cousins who graduated from SBTS during the 70’s and up to the early 90’s. One is a female with an MDiv and Masters in Music. 🙂 I am going to query them if they had ever heard of Dodeka. 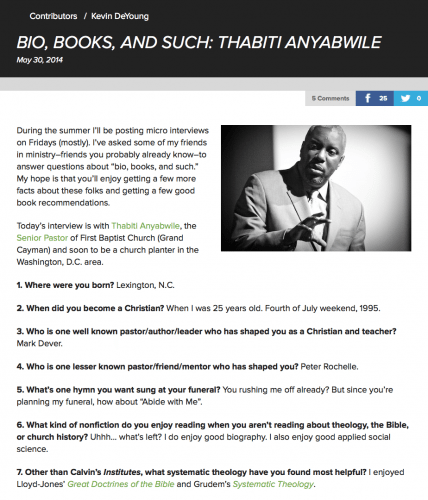 None are fans of Mohler or Patterson. All were glad to be gone before Mohler. All have great memories of high academic standards at SBTS without the indoctrination. Thanks, Lydia. Any feedback of that nature is appreciated, as neither Todd nor I have a personal connection to SBTS. Some people still question Dodeka’s importance or even its existence. I found another clip from the Louisville Journal Courier, dated 1935, that formally announces that the President of SBTS will be speaking at Dodeka. I think Dodeka was always a prestigious, secret organization. I suspect the members knew they could not keep the existence of the group secret so they went to great lengths to cultivate the “it’s only a social dinner club” front. Paige Patterson’s knowledge of Dodeka is obviously incomplete. As I documented in the article, Patterson said Herschel Hobbs was not a member, while in fact, he was. Patterson also stated, in the second video above, that Dodeka was started by Duke McCall when he was President of Southern Seminary. Duke McCall was President of Southern Seminary from 1951-1982. Janna has just posted a clipping in a comment from the Courier-Journal dated January 4, 1935. This announcement said John Sampey, president of Southern Seminary, would be speaking at their annual banquet. Sampey was President of Southern Seminary from 1929-1942. So we have evidence that two Presidents were aware of Dodeka, McCall seemingly played an active roll in the organization, while Sampey, at the very least, implicitly endorsed Dodeka by speaking at its annual banquet. “At age sixteen Mullins entered the first cadet class at the Agricultural and Mechanical College of Texas. In reality, the young school was actually neither agricultural nor mechanical in focus. In general terms is was a liberal arts college with a military cadet corps. As William E. Ellis comments, “A. and M. displayed two dominant characteristics during these early years of existence: a pervading southern ‘Lost Cause’ atmosphere and a lack of clear direction for its chartered purpose, the training of young men in the agricultural and mechanical arts.”(2) As a young cadet, Mullins received lessons in both discipline and leadership, and served as a cadet officer. His military bearing and tall stature became life-long marks of distinction. Mohler’s statement leaves room for Dodeka to have been active right up to 1993, just as the woman stated. I suspect it may likely even be active in some form today. I’m interested in hearing their responses. When it comes to Mohler, Patterson, Moore or any of them, I don’t believe much of anything they say. I usually try to read between the lines taking patterns, history, behaviors, etc, into consideration. They have all been about power. Mohler and Moore are more diabolically clever than the obvious Patterson could ever be. For one thing, Mohler and Moore patiently but deceptively acquired power over most SBC resources to use as a their public platform but both were smart enough to make many non SBC alignments/affiliations for the money flow. Impossible to really track it all. but both were smart enough to make many non SBC alignments/affiliations for the money flow. Impossible to really track it all. You would think it would be impossible to track it all. However, these guys are so arrogant that they haven’t bothered to hide the public money trail very well, in some instances. Everyone they interact with is under their thumbs, and they never imagined that an outsiders would take an interest in the financial statements of the organizations through which many funds flow. 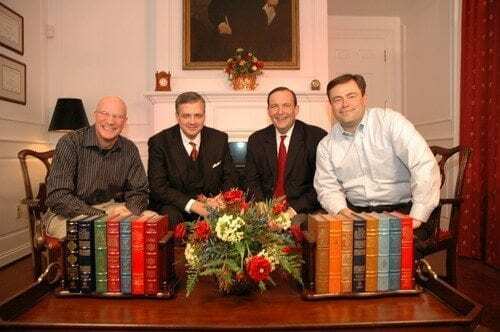 I wasn’t involved in the SBC when Mohler took over SBTS but my extended family was. Mohler came out of nowhere and the propaganda campaign was unbelievable. He was a brilliant scholar, read 5 books a week, Time mag up and coming 100, etc, etc. Soon he was on a big radio station doing the culture warrior shitck. Not much on Calvinism but if you go back, you see hints. The whole SBC Founders meme of going back to SBC roots of the true Gospel never made sense to me. But so many young people bought into it. Mass delusion following a Guru. Never questioned it. Did they know nothing of History? Did they know nothing of the evolution in the SBC away from the determinist God after the Civil War? Remember, Boyce college was started during Mohler. He could have named it something else. And don’t forget Russ Moore went right along and didn’t seem to have a problem with all the statues plaques and icons to the pro slavers. But now he is taking the SBC the SJW route. How in the world does he have any credibility? In fact, when he left SBTS, the Trustees gave him an oil painting of Broadus. Btw, Broadus’ wrote a bio of Boyce that is shocking in it’s praise for Boyce’s pro slavery work! In his determinist View, God brought slaves to America so they would be held captive to the gospel. Chilling. At best ignorant to honor this dead man with this dead man’s history. I agree, Steve. In my view, Al Mohler’s actions are often inconsistent with his word, as Todd suggests in this article. For example, he repeatedly publicly claims to care about child sexual abuse victims. However, Pastor Mohler appears to have declined to meet in person with child sexual abuse victims associated with either the Southern Baptist Convention, his denomination, or Sovereign Grace Ministries, the denomination of his best friend, Pastor C.J. Mahaney. Pastor Mohler also appears to have written a fierce defense of C.J. Mahaney, regarding a major class-action lawsuit in which Mahaney was accused of covering up child sexual abuse, without talking to any of the reported victims in that suit. Some of those victims’ stories were always backed up by criminal convictions. You would think that a man of Pastor Mohler’s stature and intelligence would make some effort to listen to the perspectives of both parties in a lawsuit, as opposed to blindly siding with his best friend, C.J. Mahaney. Pastor’s Mohler’s statement about the lawsuit in which C.J. Mahaney and Sovereign Grace Ministries were named, can be found here. Please also note that this statement was edited several times by the people who signed it. Pastor Mohler and its other signatories have not made clear which parts they changed. We only know that the document was changed, because private individuals took screenshots of its different versions. I and many others are of the opinion that Pastor Mohler’s original statement contained many factual errors, because he did not take the time to actually read the lawsuit about which he was commenting. Regarding racism and child sexual abuse, expediency seems to be the name of the game for Pastor Mohler. Hey Buddy!, I found this information for you: "Is SBTS President Albert Mohler a Racist?". Here is the website link: https://thouarttheman.org/2018/06/12/is-sbts-president-albert-mohler-a-racist/. Thank you.